Nukain is an uneducated black farm laborer working in South Africa during the period of apartheid who has nothing of his own but a vision: he paints brilliant designs on bare rocks, creating beauty out of bare bones nothing. This stunning play presses forward with the intensity of a Greek tragedy. The opening afternoon of The Nomad was a cold winter Sunday: we made it from the subway to The Flea as falling snow cloaked everything in all-over veils of white to gray … and then the show began. 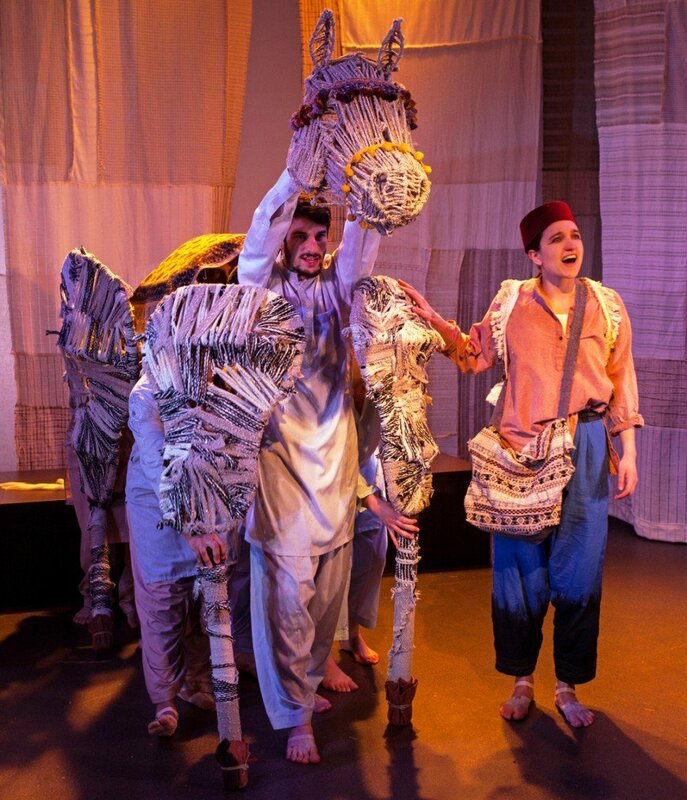 What a burst of color, brightness, and music, what delicious vibrance, as the play carries you to North Africa and its hot deserts. With insistent percussive music saturated with North African overtones, theatrical effects to delight and astonish, and the superb performance of Teri Madonna in the lead role, it tells the story of Isabelle Eberhardt (1877-1904), a well-educated Swiss woman who left Europe to immerse herself in North Africa culture and the Sahara desert. She dressed as a man for the freedom it afforded her, converted to Islam, married an Algerian, wrote about North Africa, and died in a flash flood and died at the age of 27. Heresy is topical, very funny, and totally enjoyable modern parable filled with references to today’s politics and based, roughly, on the life of Christ. Some of the characters have Biblical names, like Mary for the mother of Chris, her idealistic, purist son currently in jail. But Gurney’s a wonderfully surprising playwright so you can’t guess from that what to expect. Thirteen WNET will air The Flea Theater’s acclaimed 2010 production of Looking at Christmas by Steven Banks (head writer of SpongeBob SquarePants) beginning December 21. Filmed live at The Flea last year, this romantic comedy set in front of New York’s famed holiday window displays is directed by Jim Simpson and features The Bats, The Flea’s resident company of actors. Broadcasts on Thirteen WNET are slated for Dec. 21 at 10pm; Dec. 23rd at 3am, and Dec. 25 at 11pm. Check your local listing for air dates in other markets. Here’s the review. This is an important play about the effects on individual lives of the Civil War draft riots in New York City. Since $300 would get you out of serving, it was easy enough to see the draft hit poor men unfairly, stimulating poor vs. rich antagonisms which, however, fast turned racial — setting poor Whites against Blacks. During four days in July 1863, a Black man, woman or child could not walk the streets in safety or hide in safety, and many were murdered. In this play, the immigrant Irish represent the poor side of that equation. If you want an electric evening of theater, see In the Heat of the Night. It’s an exciting detective murder mystery story, enlarged by its vivid, shocking portrayal of what it meant to be a Black man in the deep South in the 1960’s. The play could not have a more dramatic presentation than the production at 59E59 Theaters where the audience, two rows deep, sits on four sides of the square stage. You can’t get away from the action and — grim as it can be — you don’t want to.